) Heat oven to 375°F. In 10-inch skillet, add in oil and cook ground chicken for 5 minutes or until thoroughly cooked. Add in sweet corn, instant mashed potato flakes, kale, and instant gravy mix and ½ cup water. Heat over medium-high heat, stirring frequently until the mash potato flakes have moistened. Set aside.
) In a large mixer, combine the cans of dough with 1 tablespoon all-purpose chicken seasoning until evenly mixed.
) Bringing all the edges of the dough into the center, fold the dough around the filling. Seal and roll into a ball.
) Place on baking tray lined with parchment paper and brush with beaten egg. Sprinkle the remaining ½ tablespoon of all-purpose chicken seasoning mix.
) Bake at 375°F for 15-20 minutes or until golden brown. Immediately remove from cookie sheet and serve warm. 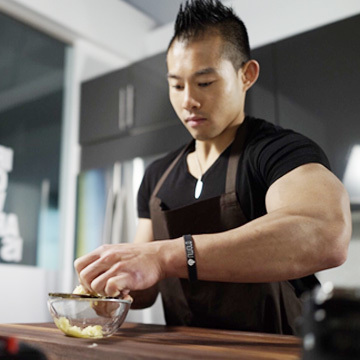 Given the nickname “Six Pack Chef” in the fitness industry, I am a young chef as well as an amateur National and International level bodybuilder for Canada. I am 26 years old and currently I’m in the process of starting my own food product company. Our goal is to create products “Where Cuisine meets Health and Fitness” so that people can “Eat Good – Look Good – Live Great”. Food has always been a big part of my life. Growing up in a Cantonese household, I was raised around food and majority of my happiest memories are of food and sharing those flavors and recipes with family and friends. I took culinary arts in high school as well as college and represented Ontario provincially and nationally at the Skills Canada Culinary Arts competition. Before attending Conestoga College for culinary arts, I was first actually at Wilfrid Laurier University for business. No, I did not drop out from the program, instead I enrolled in both programs and ultimately graduated from both. If that does not show how much I love food then I hope this will. Aside from taking two programs, I spent all my reading weeks and school vacations working for free in some of the worlds’ best restaurants. I was also fortunate to have been given the chance to compete on Season 2 Episode 16 of Food Network Canada’s CHOPPED where I ultimately came out victorious! Another victory of mine was my battle with childhood obesity and cancer, this year marking my 8th year in remission! It was ultimately due to the things cancer showed me that made me eventually leave the restaurant industry as a chef. To cook at that level requires extreme sacrifices; sacrifices that unfortunately I did not see myself willing to make in the future. My recipe “Southern Criscuits” was inspired by two things, the first being the creation of a new “food” and the second being good ol’ Southern comfort food. What’s a “Criscuit”? It’s what we all dream and want in a fresh baked good! The light, buttery flakiness of Crescent Rolls with the soft, tender crumble of Country Biscuits! With endless uses and possibilities, the Criscuit is the perfect vehicle for deliciousness! These individually sized Criscuits take on a Southern influence with the flavors of great Southern classics…. Fried Chicken Spiced Pastry, filled with a mixture of chicken, sweet corn and mash potatoes, kale and cheddar cheese. I deserve to win #BakeItPossible because I have a creative and simple recipe that is versatile, shouts “WOW” and most importantly is incredibly DELICIOUS! This recipe is what #BakeItPossible, Pillsbury and Betty Crocker are about: making great food people love. I can guarantee you that with one bite, my Southern Criscuits will have people falling head over heels. Just like how my happiest moments are of food, family and friends, I know that my recipe using Pillsbury and Betty Crocker products will create those moments for those that try it!